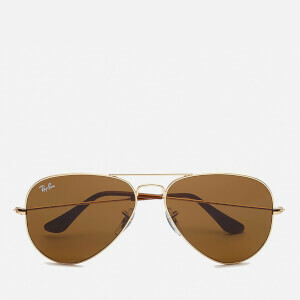 The iconic Aviator Sunglasses from Ray-Ban are the most recognisable style in the history of sunglasses. Made with thin metal frames, a double bridge and teardrop shaped lenses, the sunglasses were originally developed for pilots to protect the eyes and prevent light from entering when flying. Inset with Brown Classic B-15 lenses (originally designed for military use), the sunglasses absorb 85% of visible light and block out the majority of blue light for remarkable colour contrast and improved clarity for a 'natural vision' experience. 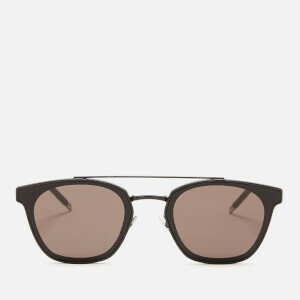 Constructed with nose pads and ear pieces for comfort, the unisex sunglasses feel as good as they look. 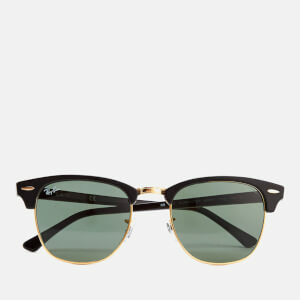 Finished with the brand's signature monogram to the lenses. E.N. Frame: Metal. Lens: Brown Classic B-15.